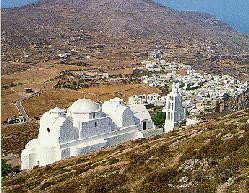 Folégandros is a wonderful island, little visited by tourists, in the south western part of the Kyklades group. It is about 13 kilometers long (8 miles) by 3.5 kilometers (about 2.5 miles). Its surface area is 35 square kiloteres. It has two main communities, Folégandros and Apáno Merá (also known as Ano Merá). Adorned with beautiful beaches it is a quiet haven (of course when there is direct airline service to the island, as in many other places, it would be a different story). The name of the island comes from the Minoan Folégandro, meaning that there was Minoan presence on the island since about 1600 BC (Crete is south of here). Another explanation is that the name comes from the Phoenician 'Phelekgundari' which means 'dry place.' 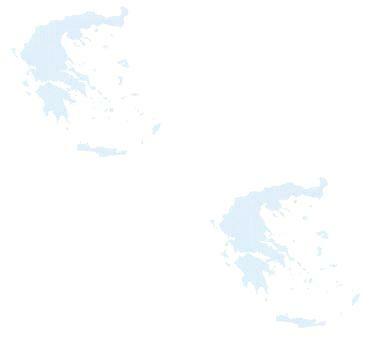 Yet another name of the island is Folékadros, which is refered to by Ptolemai(III book, 15,32). The island was occupied by the Dorians who were followed by the Ionians, as witnessed by ancient ruins attributed to both of these tribes. Later on, the island was under the Athenian control (it paid taxes) and then under the Romans (under Tiberius) and finally under Venetians. A castle on the island bears witness to the occupation by the Venetians. The Russians held the island, as all the others, from 1771 until they were passed on to the Turks in 1774. Many famous artcheologists passed by the island, including Thevenot (1655) and Boschini (1658). For a time the island was unoccupied. Boschini however heard a story describing how people tried to occupy it. A cleric visited the island and decided to stay. and executed him in a cave. For some time after that, noone made any effort to come to the island. In 1770, Tournefort arrived, followed by Pasch van Krienen in 1771. They found out that the island had been deserted since 1715 and was just then being re-occupied. Until 1940, the island was used as an exile destination. Many ancient ruins abound including roman sculptures, columns and other artifacts scattered around. In the old castle there are many items from the middle ages and in the Golden cave there are other ruins, worth seeing upon a visit. Transport: From Pireaus there are 3-5 ferries per week, depending on the season. The trip takes 9 hours (info: 01/ 4226000). You can also visit the island from Santorini, Milo, Anafi and other islands (info: 0286/41203). The main port of call for the island, littered with whitewashed houses. Beautiful beach and plenty of snorkerling opportunities in the rocks nearby. North of the town, is the cave of Faraggi who, tradition says, is connected with the Golden cave, situated about 1500 meters north. This is a little explored cave with wonderfull stalactites. We can get to it either with boat from Karavostásis, or by walking and then climbing up steep hills. The main town of the island, full of white washed houses and whitewashed churches (the main style of the Kyklades - for example see the Paraportianí church). The town has a total of more than 73 churches, ranging from small chappels to the main church of Panagiá. Above the Hóra, is the castle, built on a rocky outcrop. The houses within, were built next to each other making the outside wall as they went along. The view from the Castle is fantastic. The town of Ano Mera, found a few kilometers north of Hóra, is the second largest community on the island. Three windmills are in evidence on the road from Hóra. At this point to the left is a road towards Agios Nikólaos where plenty of snorkelling and spearfishing (be careful) can be undertaken. Ano Merá is a nice town adorned with few visitors and a folklore museum.